Abstract. Hurdle models based on the zero-truncated Poisson-lognormal distribution are rarely used in applied work, although they incorporate some advantages compared with their negative binomial alternatives. 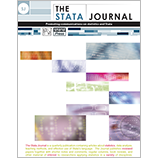 I present a command that enables Stata users to estimate Poisson-lognormal hurdle models. I use adaptive Gauss–Hermite quadrature to approximate the likelihood function, and I evaluate the performance of the estimator in Monte Carlo experiments. The model is applied to the number of doctor visits in a sample of the U.S. Medical Expenditure Panel Survey.